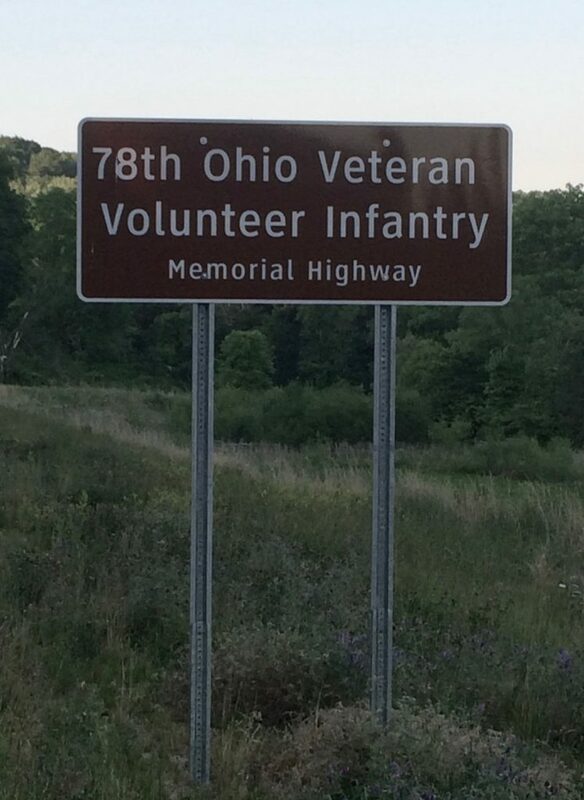 In 2014, though the actions of State Senator Troy Balderson (R-Zanesville), whose district includes the most northern township in Athens County, signs were erected in each of the four counties through which State Route 78 passes — Athens, Morgan, Noble and Monroe — designating the winding road as the “78th Ohio Veteran Volunteer Infantry Memorial Highway.” This is quite fitting as each of these counties supplied men to the 78th. The highway goes near but not through Muskingum County, which also had a number of its men serve in the 78th. Since Civil War veterans were still alive at the time state highways were given numbers it seems possible that the designation of this highway as Rt. 78 might not have been a total coincidence. This sign is near the beginning of St. Rt. 78 in Athens County, just outside Nelsonville.